This is an excellent promotional item from Calendar Lady Promotions to ensure that you stay advertised and stay seen. Our High Viz Drawstring Rucksack With Logo is a promotional nylon drawstring rucksack with a high visibility strip and reinforced corners. Plenty of room to have your business details and company logo printed upon our High Viz Drawstring Rucksack With Logo to ensure that you stay advertised. 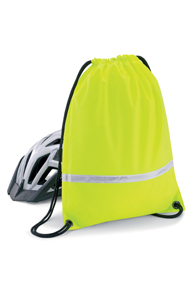 So promote your business details and company logo upon our High Viz Drawstring Rucksack With Logo today! To find out more about our High Viz Drawstring Rucksack With Logo click here and fill in the contact form and we'll get straight back to you. Other promotional and personalised items besides our High Viz Drawstring Rucksack With Logo click here.